Is it good for posture? Made to offer active seating, the Leaning Stool is made to support torso rotation. 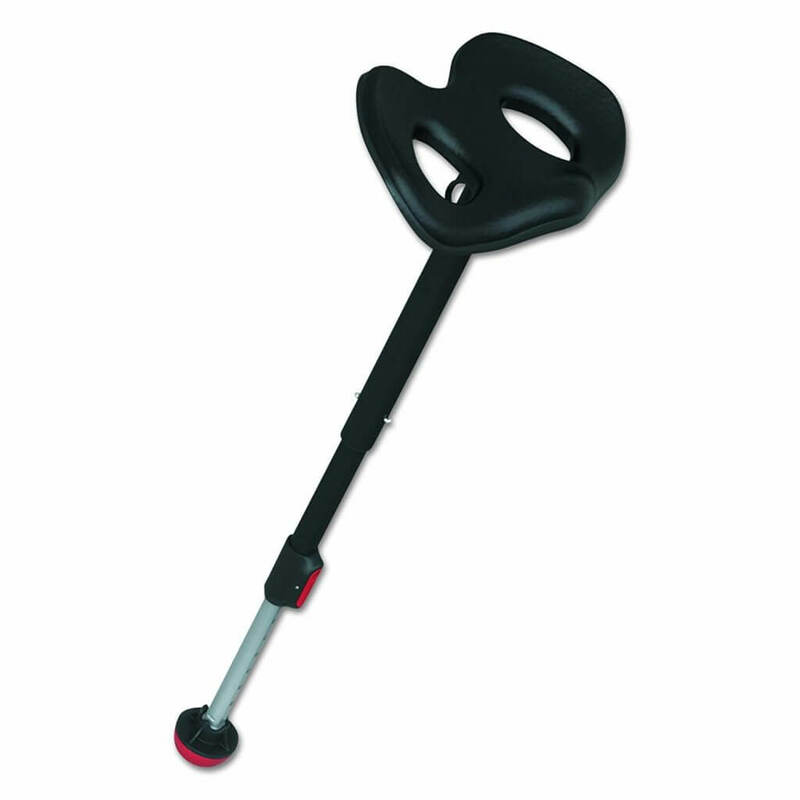 It is also made with a height-adjustable design. As one of the ergonomic stools, it combines proper anatomical comfort with good versatility. The Leaning Stool made by Focal is one of the most reliable products in its class. All of its characteristics imply that it has been made with attention. The stool has an intriguing design as it uses ergonomics’ principles to offer what can only be seen as temporary sitting. Unlike most stools on sale, it actually manages to offer a degree of comfort which is not really seen in these stools. It is expected that an office chair would be ergonomic and comfortable, but this is not often the case with adjustable stools. The Leaning Stool goes even further. It uses a large base with pivoting movement support. This allows users to freely move left and right. It even allows users to move back and forth to help stay more relaxed and to generally be more active while working at a desk. With an active seating profile, the Leaning Stool is actually made to promote an alternative to traditional chairs. If there is not a lot of scientific evidence to support the role of leaning stools for health, it has been already shown that sitting for long hours every day can come with various health problems. It is why most people should take a look at how they work and make a fair analysis of what can be improved. In most cases, adding a bit more activity is all that’s needed to improve health or at least the posture. It is where the Leaning Stool comes to offer a helping hand. Its objective is not to replace traditional office chairs. But its main objective is to actually offer an alternative to sitting. Of course, the real alternative is standing. But even standing for too long can come with discomfort. It is why a stool is a type of transition between sitting and standing. It allows users to relax after a period of standing. At the same time, the Leaning Stool encourages proper posture as it is clear the stool actually strengthens the core muscles of the body. Furthermore, the stool can also be among the most interesting alternatives for the typical office chair with big armrests which promotes inactivity or even laziness in some cases. The right sitting position on the Leaning Stool creates an angle between 130 and 135 degrees between the torso and the legs. It is not fully upright. It is also far from the 90-degree sitting angle. This has been calculated to be one of the best angles for modern stools. The entire stool sits on a pivoting base. The base is round which can cause a bit of confusion for potential users. But the round base is perfectly stable. Even more, it allows a level of freedom that is not seen with fixed stools. It actually allows 360-degree movement that most users get to love. Furthermore, it can create one of the best supports for rotation movements of the torso. Leaning to reach the printer or to get some documents is easier and actually active compared to when sitting on a chair. But users can fully rotate with the stool. This makes it a valuable design in retail where cashiers often need to reach products behind them as well as those in front of them. The Octogrip Overmold is actually a valuable base. Apart from offering 360 rotation, it also works for good traction. There is a large surface area in contact with the ground. This means the Leaning Stool is really capable to offer the stability needed even on slippery surfaces such as tile. Another top feature to consider is height adjustability. This is the same height adjustability seen on office chairs but simplified considerably. With the help of a lever, users can set their stool at their height of choice. The minimum height is 26” while the maximum height is 35”. This makes the stool one of the most adjustable options in its class. So where would this adjustability show its full potential? Users come at various heights and this is where the stool can support them as needed, on an individual basis. At the same time, the users can also set the stool to a height suitable to an activity. For example, attending stand-up meetings can require setting the stool higher. Using a standing desk can also come with a higher seat position. But even sitting is possible on the stool, especially when working at a classic fixed desk. The comfort of the seat is also worth mentioning. It is not often that users can enjoy molded ergonomics on a stool. In fact, many stools are actually uncomfortable. It is why all users should be able to find their own solution unless they can find a design similar to the Leaning Stool with its ergonomic shape. While it is cushioned, the seat is not the most comfortable. It’s made to support the body anatomically first, which means it offers all that’s needed for proper posture. Even with such an adjustable design, users can still expect top-level durability. It is surprising to know the stool actually supports users of up to 300lbs. It is why it can often be one of the options to work within the conditions of heavy use. Even borrowing it at the office from one co-worker to another is easy as a result. There are not many limitations to consider with the Leaning Stool as it outperforms most of its rivals. In the segments of support, postural support and stability, it outruns most other stools. However, there are a few general limitations that stools fall under and the Leaning Stool is no exception. It is actually a stool to consider with full standing as well. It is after an hour of standing that users can sit on the stool for an hour and then on their chairs for an hour before repeating the process. For this reason, all users should actually be able to set their own standards when it comes to what their body can take with active sitting. At first, this period will not be too long. Most users won’t be able to sit on the adjustable stool for more than half an hour. But after a few days, their activated core will start to support their bodies better, making up for the stool’s movements and balancing the body better. There is no denying users can actually find impressive benefits on the long-term. But the issue of the seat is also worth mentioning. Since the stool doesn’t come with the most cushioned seat, users might actually struggle to find the best position to stay in. This doesn’t go away with time. In fact, the more they sit on the hard surface, the more they will realize they need a break. But the stool is not necessarily more uncomfortable than its competition, it might just be used for shorter periods. The Leaning Stool comes with impressive 300lbs weight capacity which sees it as an option for all types of environments. Made with an ergonomic design, the waterfall-style seat will not put any pressure on the back of the feet. But the Leaning Stool is an active stool which requires users to move around to make the most of its new design. Adjusting the height of the stool changes the way it feels for most users. Luckily, there is a simple lever which can be pressed to activate the piston and make the stool actually adjust easily. For most users, it is a good opportunity to find their desired height, especially if they are new to a standing desk and if they want to combine various types of sitting and standing to correct their postures. The piston is reliable and it is durable as well. Together with the seat, it handles large user weight which places it on the same level with the most capable designs in its class. Furthermore, the Leaning Stool is also a top priority for those seeking the ultimate results when it comes to freedom of movement. It is the users who can actually benefit from the durable piston as they should take advantage of the various height settings during the day. The pivoting base can go a long way in terms of mobility. 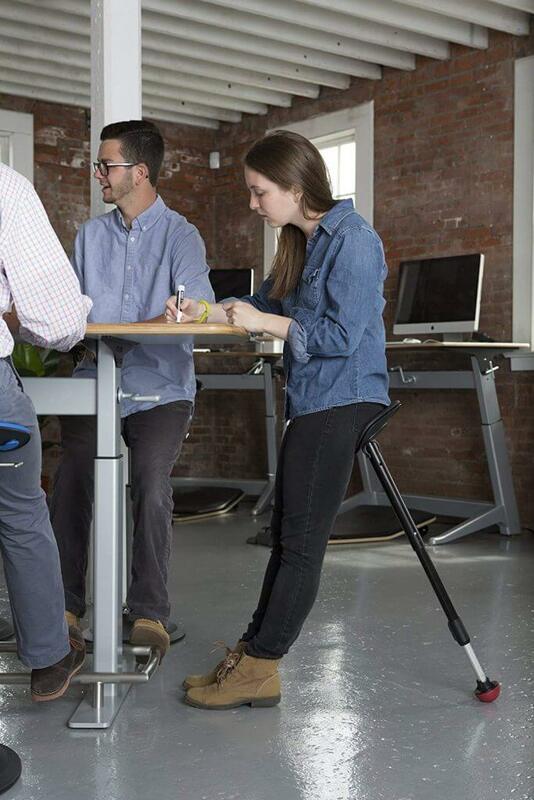 With proper torso mobility and the ability to reach objects without leaving the stool, most users can find a level of freedom they are not used to. Some users have even reported reaching far to their desk’s edges without losing grip. This is where the Octogrip Overmold rubber base goes a long way. The stool itself might not improve the posture of its users. However, its ergonomic seat design means that there is proper anatomically-correct support for those who want to have better posture. In combination with other actions such as standing and setting the monitor at the correct height, users can find their posture improving over time, even when using the Leaning Stool. Seat ergonomics used to be an issue with reduced importance even a few years ago. However, this has changed considerably. It is why most users can simply find better results with their posture with these ergonomic designs. Even the fact that they are now affordable can simply raise awareness and make most users choose these stools over alternatives. The Leaning Stool is one of the most robust designs in its class. It comes with one of the larges rubber bases seen in this class. This base is what actually allows full 360 rotation as it can support the user and the stool from all angles with no slipping. But the stool also comes with robust construction. If lightweight users have no reasons to worry about slipping, the same goes for the heavyweights as the stool supports up to 300lbs with ease. But one of the most intriguing design aspects comes with the actual seat ergonomics and how well all of these elements work together. The Leaning Stool is a mature product. If users were to choose a single stool without having the possibility to make an upgrade in the future, the Leaning Stool would definitely make it into the top 3 final options.